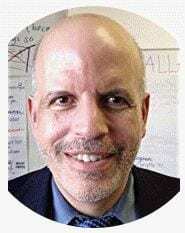 This article is the first in a three part series: This article, part one, is entitled, “Entry, Reframe and Walk Away.” Part 2 will be about “Circling Back,” and part three will be about, “The Explanation and the Referral.” This topic is of critical importance in the face of the School-to-Prison-Pipeline. Somehow, someway, we want to figure out how to keep some of our most challenging students in class, but we want to figure out how to keep them there without sacrificing our quality of instruction. “I’m not on my cell phone!” Declares Tom loudly, while texting. “I wasn’t chatting with friends!” Melissa loudly declares, while chatting with friends. So many of our most challenging students are driven to prompt conflicts with their teachers and other authority figures. They deny everything, and try to turn every exchange into an argument. Many kids do this all day long. Attempting to redirect these kids can be incredibly challenging. They often seriously disrupt the day’s learning, and leave us feeling completely deflated. Often, these are the kids who get one referral after another all day long, who seem to make a routine out of getting kicked out of class. They are masters of escalation, somehow knowing how to push buttons and turn a polite reminder into a heated exchange with the teacher, significantly disrupting the class and tearing your well-planned lesson to shreds. The first step is about how you enter into the interaction with the student. This approach can be done even when there isn’t a behavior issue that needs to be addressed, and should be. Research has suggested that our focus on learning different types of interventions to curtail misbehavior may not be the best way to understand classroom management (Corbett & Wilson, 2002; Frymier & Houser, 2000; Johnson & LaBelle, 2017; McIntyre & Battle, 1998). 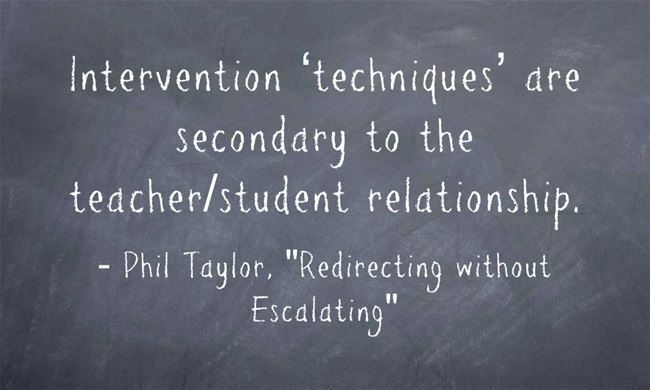 Intervention ‘techniques’ are secondary to the teacher/student relationship. 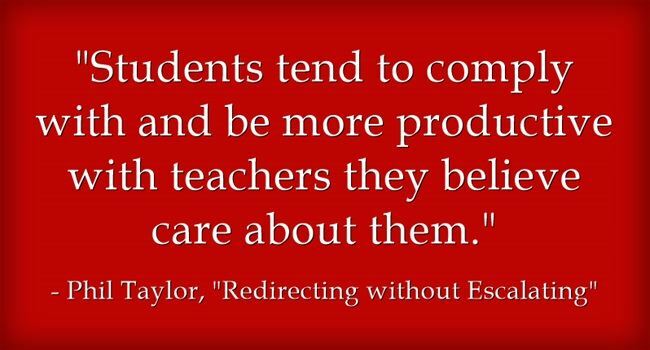 Students tend to comply with and be more productive with teachers they believe care about them. Such a relationship appears to be primary in terms of whether an intervention will be effective or not. Technique, the type of intervention used, is secondary. Thus, even as I provide this ‘technique’ we have to take what’s being presented here with a grain of salt. The ‘technique’ here is about reminding ourselves about the importance of the teacher/student relationship, as well as getting onto a positive track with these conflict-driven students. For many difficult students, exchanges with teachers are one argument after another, all day long. What this approach is about is shifting that dynamic. There are several ways to enter, but the point here is disrupt the routine, to start a new track. We want the student who is ready to jump into their routine of denials and arguments to relax and experience a different kind of exchange, maybe even a little connection with the teacher. Simple inquiries into their interests, their lives, appropriate compliments about their attire or new hair style, are all easy entry points to cue up a different kind of conversation. Yes, this is a more time-consuming approach to redirecting students, but when you consider how much time these conflict-driven students can steal from class anyway, you’re just using up that time on the front end instead of the back end. It’s important for this exchange to be authentic. Really inquire, and really get to know that kid for a minute. Listen. Laugh if he makes a funny joke. Be with the kid and enjoy being with him. The walk away is as important as the reframing. So often, teachers are trained not to accept pseudo-compliance, to ‘post-up’ and make sure that kid does what you’re telling them to do before moving on. Unfortunately, with conflict-driven students, this is only seen as an invitation to a fight and to push back. The more you push, the more they push back. These kids feed off of such a dynamic. So, in these cases, the walk away denies them the opportunity for that engagement, and leaves them with the positive exchange. It also give space, provides the student with a space to make a choice. Such space is a huge sign of respect. This doesn’t mean you aren’t going to circle back if they aren’t going to make the right choice, but it does mean you aren’t giving them the opportunity to turn this moment of concern into an argument. It’s also important to carry the tone of that walk away as if you are busy. You have other kids to work with, other papers to look at, and other kids to get to know. So, move on and get to work! You aren’t worried about that kid anymore, you’re too busy to play some weird back and forth game with them. You expressed caring and interest, reminded them to get on task, then got to the next part of your job. Busy, busy, busy. You are doing what you want them to do – staying on task! Of course, this isn’t a magic bullet! Many kids will use this opportunity to get right back to chatting with friends or playing on the cell phone or whatever it was you were addressing from the start. This is why the second article in the series is about how to circle back. I’ll have that article available shortly, but give this a try and see if you can get a different track going with these really tough cases, and I bet you’ll be surprised on a few occasions. Please provide feedback if you have questions or concerns or let us know how this works for you! I hope this helps get you started on working with those particularly challenging students. Good luck my fellow catchers in the rye! Corbett, D. & Wilson, B. (2002). What urban students say about good teaching. Educational Leadership 60(1), 18, 5, c1. Frymier, A. B., & Houser, M. L. (2000). The teacher-student relationship as an interpersonal relationship. Communication Education, 49(3), 207-219. Johnson, Z. D., & LaBelle, S. (2017). 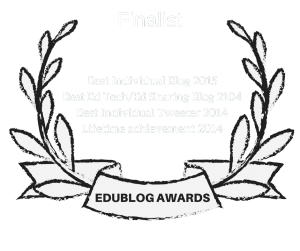 An examination of teacher authenticity in the classroom. Communication Education, 66(4), 423-439. McIntyre, T., Battle, J. (1998). The traits of “good teachers” as identified by African American and white students with emotional and/or behavioral disorders. Behavioral Disorders 23(2), 134-142.